...or the wreath might fall off! A screen door is a wonderful thing because it lets in all the summer breezes in and looks so great with a wreath on it. Hope you like my screen door card! Gorgeous. Love the sideways sentiment. This is lovely, Kren! Really like the play on blue. And that sentiment says it all. I'll be following you, if you don't mind. lol. You've got some fab creations. And thank you so much for taking the time to leave me a sweet comment. Thanks for stopping by from Make It Monday. Your screen door card is adorable! Very creative indeed. Have a great evening. I love this, Kren! Your wreath looks so pretty hanging on the screen door. Good job with the Inspiration Challenge on Speedy TV. Thanks for playing!!! This is so pretty. I love the screen door with the beautiful wreath. Fabulous card Kren..love the sentiment and lovely blues. 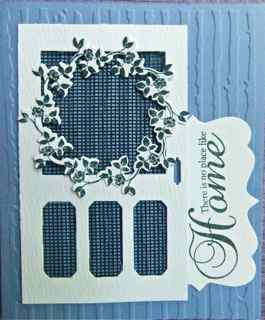 This is such a pretty card, I love the screen door! A screen door is crucial here...it was 38 degrees yesterday and we were melting! We try to manage withthe fans and the screen door and windows open till mid morning and then swith over to the AC. They have a LOT of dies that I wish I could get! I like the screen incorporated into the door. Perfect use of the mesh Kren!